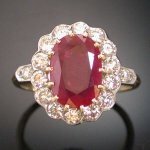 Looking for an antique or vintage ruby ring? Maybe some ruby engagement rings. Adin has some exquisite examples set with ruby. Red variety of corundum, alumina (AI2 03) colored by chromium. Hardness: 9 density 4 indexes of refraction:1,76 -- 1,768. Of all the invaluable stones, most exceptional is certainly the ruby. Its red color, the rare pius of the mineral kingdom, symbolizes the heat and the fire of passion. Result of a rare alchemy enters alumina and chromium, of a remarkable resistance just placing it behind diamond. Although one finds rubies in Pakistan and some in Tanzania the majority of the rubies which are on the market come from Thailand or a new mine of Myanmar, most famous of the geographical origins has remained the valley of Mogok, in ex-Burma, which produced, for approximately fifteen centuries, the most beautiful rubies of the world. To describe the most beautiful color, one did not find better than to compare it with the blood of a pigeon. A negligible part of the production corresponds however to this comparison and these stones are really extremely rare. They were it already before the nationalization of the mines, in 1969, and almost disappeared from the market. The burmese rubies, which one also called "ruby of the East", are not all blood-of-pigeon, but they have in common a color, more or less saturated, characteristic, described like a "red with a memory of blue", from which it releases a fluorescence which makes it sharp and merry. They often have very fine inclusions which give them a silky reflection. The shortage of the rubies of Mogok supported the rise of the mines of Thailand. Indeed, the "rubies of Siam", as they were called, were little appreciated, their color being darker because of the iron than they contain and their purer crystallization make them appaer more cold, but they saw their popularity increasing as the Thai mines became the principal source of rubies.In their best color, they are of a bright red. The taste was some somewhat modified and the concept aired blood-of-pigeon replaced little by little by a tone which does not tolerate any clear nuance anymore. The largest amateurs of burmese rubies were the Maharajahs, who liked to gather themselves some, to cover with it their weapons, their crockery, their thrones. That of Nadir Cbah is constellated with it, it counts in particular two rubies of 35 and 100 carats. The terrestrial sphere of the Treasury from Iran, in Teheran, counts two remarkable rubies by their size (50 and 75 cts). Our princes, on the other hand, believed to have exceptional rubies which they were not (they were actually spinels). Among these large historical stones, most known are the "ruby of the dark Prince", assembled on the British imperial crown (Turn of London) and the "ruby" of Anne of Brittany, the Coast of Brittany, which decorated the order of the Golden Fleece of Louis XV (museum of the Louvre). Our ancestors however had noticed some differences in the color which is moderate of orange, since they called them "balas ruby", a geographical term probably of origin evoked in the voyages of Marco Polo. That gives of them only more price to the true rubies of gemmeous quality, very rare beyond 10 cts and whose value increases considerably according to their weight. Thus one saw the biddings flying away at the time of the sale, in New York, in 1986, of a ruby birman cut out of pear, of a weight of 15 carats, allocated I million 540 000 dollars. This record of ventilated price exceeded in Paris on July 19, 1988 by a cushion of 10,35 carats allocated 10 million francs, with certificate attesting its origin birmane. This ruby, as well as an oval of 14 of the same carats origin (sold 5 million 200 000 francs), had been pawned at the municipal Credit of Paris (pawnshop). The prices are not lower in Burma, since a cabochon of 38 carats was allocated 5 million 800 000 dollars to emporium of Rangoon in 1994. It is necessary to go to see these exceptionnal stones when the opportunity arises, because the rubies of great value do all started from private collections and are generally inaccessible. The successions also make it possible to discover them. Thus that of the duchess of Windsor was the object of a great sale and a book. It had in particular a signed rigid bracelet of Ruby, carrying two burmese rubies cut in the form of cushion of a weight of 36,15 carats. Compared to these exceptional stones, the 72 rubies decorating the pair of bracelets of the duchess of Angouleme are of poor quality (museum of the Louvre, gallery of Apollo). The ornament supplements were composed of a diadem, two collars, a cache-peigne, a pair of Ruby, of a belt, of three fasten and a pair of bracelets. It was created by Menières in 1816 to àpartir of that of the impératrice Marie-Louise and was enriched by Evrard Bapts by 48 rubies for the Dauphine one, which carried it for the sacring of Charles X description mentions "a superb ruby of the East rich color, beautiful form, of 6,94 carats, a ruby of 2,44 carats, twenty-two rubies of various sizes weighing 23,36 carats together". The ornament comprised on the whole 399 rubies for a weight of 421,82 carats. The large collar was sold in 1982 in Geneva, where it was allocated 900 000 francs Swiss, the diadem and the bracelets were sold at the time of the dispersjon jewels of Craven lady in London in 1961. In Paris, one can see the rubis of 2,63 carats which belonged to the Treasury of State, deposited in 1887 with the national Natural history museum of natural history and the museum of the romantic Life in the collections of George Sand, a ring decorated with a ruby very clearly assembled on spangle, given by Marie-josèphe of Saxony to his Aurore niece of Saxony. The largest known ruby remains that of the crown of saint Wenceslas (250 carats), preserved in the treasure of the Sainr-Guy cathedral, in Prague. Among the large ruby, it is also necessary to mention the spangled rubies, of which most significant are Smithsonian Institution in Washington, with thePlain ones. It is of Rosser Reeves ruby (138,7 cts) and about the Long Star ruby (100 cts). The phenomenon of asterism appear when the stones are constellated with fine needles directed with 120 "and cut out of cabochon. Erant given the scarcity of the large rubies, the jewellers and concise developed two systems of crimped invisible, which makes it possible to create great paved surfaces of low-size stones but of very beautiful quality without visible metal. Crimped "the mystérieuxe of the house Ruby goes back to 1933 and retains the stones between two rails, while in the other process the stones are crimped on only one side, which allows more flexibility. This extremely delicate work requires to be completed by senior and specialized craftsmen, to which one gives the name of "large hands". Among the most famous parts of this style are the large clip of the duchess of Windsor, sheets of houx, one in gauged rubies and diamonds rods, the other very out of diamonds (1936), as well as a pair of Ruby representing of the sheets of ivy. A precious stone that is a red variety of a transparent corundum. The colour ranges from pink to deep red; the pigeon's-blood ruby is deep red tinged with purple. Flawless specimens showing the most desirable colours are rare; the varieties of shades are due to the presence of a small quantity of oxide of chromium. Some rubies show asterism. Rubies may be cut as brilliants, but more often are mixed cut; sometimes they are cut and strung as beads. They are occasionally termed 'true ruby', 'red corundum', or 'Oriental ruby'. The principal sources are the Mogok district of Upper Burma for deep-red rubies, Sri Lanka (formerly Ceylon) for light red, and Thailan (formerly Siam) for dark brownish-red. The best rubies are more costly than diamonds of the same size, and are exceeded in value only by the emerald. Rubies contain some tiny irregular inclusions; synthetic rubies have bubbles that are perfectly rounded instead of being natural crystal shapes, and can be further identified by having striae in straight rather than curved lines. Among the famous true rubies are Anne of Brittany's Ruby; De Long Star Ruby; Edwardes Ruby; Peace Ruby; Rosser Reeves Star Ruby. Some well-known so-called rubies (known as a Balas ruby or ruby spinel) are in fact red spinel. Browse our catalogue to find some fine examples of Antique and Vintage ruby jewelry. You'll discover stunning engagement rings and eternity bands.